David Wagner, an internationally acclaimed hairstylist, entrepreneur, and “Daymaker,” is the owner of Juut Salonspas, the original Aveda salons. 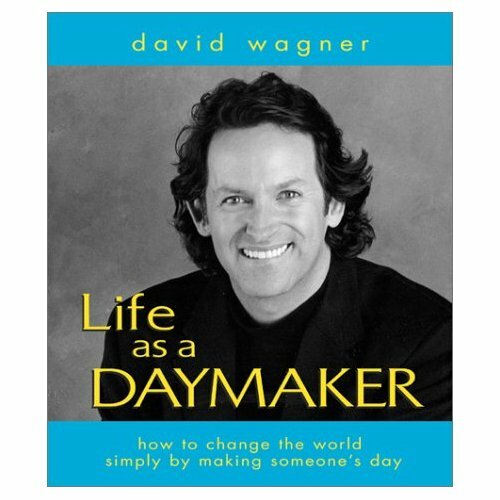 His best-selling book, Life as a Daymaker: How to Change the World Simply by Making Someone’s Day, has helped generate a worldwide kindness movement. In this inspiring video interview, David, who was diagnosed with cancer earlier this year, candidly shares how he faced his own mortality and how his cancer experience has changed his life. Click here to visit his Daymaker website. Click here to view David’s YouTube videos. In the above interview, David referenced a powerful story that he shared with me for my book, Sixty Seconds: One Moment Changes Everything. Here is an excerpt from that profoundly moving story. Luckily, I was able to fit her in. I was in a great mood that day and I was really “on.” I gave her a great scalp massage and shampoo like I always did, and then styled her hair. We had a blast the whole time. We laughed and joked and entertained each other. When she left, she gave me a big hug that lasted just a little bit longer than usual. Two days later I got a letter from her. When I started reading it, I froze. She said she had planned to commit suicide that day, that she had come in to get her hair styled so it would look good for her funeral. She said she had changed her mind during her appointment, that I had helped her realize that her life could be better. She had gone home and called her sister to tell her what she was going through, and her sister had taken her to the hospital. I was stunned. If you had lined up a hundred of my clients and asked me to choose the one who was considering taking her own life, she would have been at the end of the list. She was gregarious, she was outgoing, she seemed successful. I had no idea that she was in such a dark place. I was glad, and humbled, to have made such a difference, yet I also felt a little uneasy. I wondered what would have happened had I been upset or distracted when she had come in and I had just gone through the motions of cutting her hair. That day, I began to feel an enormous sense of responsibility. How many of the ten to fifteen clients I saw every day might be in a personal crisis and in need of a little extra kindness and attention? Even if it was just one person a week, I realized what a big difference I could make. I resolved then and there to treat every customer like I had treated that woman. Today, whenever I catch myself thinking only of my own agenda, I go back to the moment when I opened that letter. And I remind myself that days are made of moments, and how I choose to be in those moments is what’s going to determine the quality of my day, which in turn can affect the quality of someone else’s day. What it all comes down to is this: If you’re going to be there, be there. You might be somebody’s only angel of the day and you can’t take that for granted. Click here to read a short testimonial from a woman who had lost her will to live but was inspired by David’s book to love, hope and embrace life once again. Hello all, I just returned from Mayo Clinic and it appears that I am in full remission. I have a bone biopsy on Thursday to confirm but it looks good. Life is great. I just heard back my bone marrow biopsy turned out clean so I am in full remission. Thanks for all the prayers and well wishes, it made a huge difference for me. We’re dancing at the Wagners. 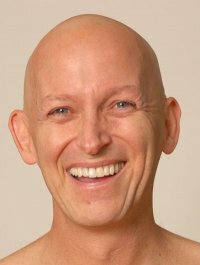 A few weeks ago, I interviewed JUUT Salonspa Owner David Wagner regarding his battle with lymphoma and his Faces of Cancer project for our Business Builders e-newsletter. Our staff was really happy to learn a few days ago that initial tests show that David’s cancer is in remission, and we hope the positive reports continue. But, I can’t stop thinking about something David told me during that interview. As we were talking, it dawned on me that his health battle coincided with the judging for our SALONS OF THE YEAR competition. His Edina, Minnesota salon was our 2008 winner, so we had asked David to serve as one of this year’s expert judges. I told him that I had no idea about his condition then, or would never have asked him to take on the task. It just goes to show you that you never really know what is going on in someone else’s life, nor how something you may do or say may impact them. Chances are that kind of magic happens in the chairs of your salon every day. It’s a lesson that David, as the author of Life as a Daymaker, has been teaching us for years. And, now I want to thank him for making my day with that story. Click here to see all my posts featuring David Wagner. This entry was posted on August 17, 2009 at 4:29 PM and is filed under See INDEX categories above. You can follow any responses to this entry through the RSS 2.0 feed. You can leave a response, or trackback from your own site. Yet again anolther fabulous video. He may have done all the talking but you found him and asked the questions. Thank you, really enjpoyable. Somehow seeiong a video brings it all to life as reading your book felt like it was doing that, but seing him in the felsh is so different and he’s so real! You’re very welcome, Kath. Glad you enjoyed it! Glad you found it meaningful, Akadi! My pleasure, Sharon. I’m sorry to hear about your mom. Thanks for sharing David’s story.I am one of his friends and have heard and read his tories many times.They are never less inspiring than the last. You are quite welcome, Daniel. David is indeed an inspiration to many. This is great story and articles, i have never visited your blog but will visiting again. Your post is inspiring many people. You’re very welcome, JoeSani! I hope you stop by again soon!